When The Plague was first published in 1947, France was recovering from the horrific experience of the Second World War. For this reason, Camus’ is a novel that is rarely read outside the context of the Nazi occupation of France and the effect this had on the lives of thousands of ordinary men and women in that country. Camus was well placed to write about this, as the editor of Combat from 1943 to 1947 he was actively involved in the French resistance movement, and The Plague is usually read as an allegory of the fight against Nazism and oppression. Whilst there is no doubt that the French resistance hangs heavily over this book, the author’s personal attachment to it runs deeper. For example, Camus was stranded in France when the Germans invaded in 1942, cutting him of from his wife and child in Algeria. As such, it is a novel about exile as much as it is a novel about resistance. Perhaps one of the key features of The Plague, and certainly one of the reasons it stands out from other post-war French novels dealing with the fight against the Nazis, is that it does not glorify its characters’ struggle: the war against the illness that threatens to eradicate the population of Oran is a war that is waged in a routine, thoroughly unexciting fashion. Dr Rieux, the narrator and protagonist of the novel is the embodiment of this attitude, and is portrayed throughout as the ultimate professional, approaching his daily medical work with methodical diligence. This is not to say that Rieux is not a hero, for he is certainly that, but he is more demanding and complex than your average knight in shining armour. 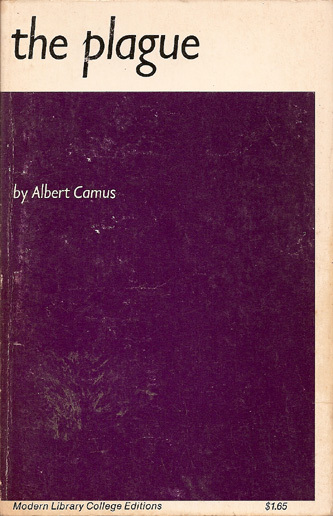 In fact, to understand him properly we must draw from Camus’ other work, most importantly his philosophical writing. The Myth of Sisyphus, published in 1942, is the text that introduces us to the Camusian concept of the “absurd hero”, and in many ways Rieux is a Sisyphus of the real world, repeatedly rolling a rock up a hill in the knowledge that the ordeal will never end. By analogy, therefore, the struggle against the plague is not just an allegory of the fight against oppression and Nazism, but of the fight against the absurdity of the human condition. As such, there can be no final victory or climactic liberation: Camus’ war is a war that is won and lost in the mind. The above is a comment by Rieux, but it could well be ascribed to Camus himself. And yet the doctor is not simply the author’s avatar, and the easy identification of Camus with his hero and narrator is not actually that straightforward. For starters, Camus was not a doctor, he was a journalist and writer, like the character Rambert, the stranger to Oran who plans to escape the city’s quarantine and return to his wife and child in Paris. Of course, once you have started looking for Camus in his characters, you find him in most, and this gives the novel a disconcerting realism, as if all the contingencies of life are played out from the same starting point. Here, we begin to edge towards the existentialist in Camus, a label he was always uncomfortable with, perhaps because, having been both a pacifist and a resistance fighter, a Communist and a non-Communist, he understood the uncertainty of life.